More than once, The Legal Genealogist has said it. The Statutes at Large — those published volumes of laws passed by Congress — are online free at the site for the period from 1789 through to the adoption of the first organized code of laws in 1875. And even with all the times I’ve pointed to this resource, and specifically to these laws, I’m still stumbling across features in these pages that I hadn’t noticed before. I’ve read through those laws and more… and studied these volumes… and still overlooked something until last night. There are some really neat tables in the front of particularly this first volume of federal statutes that we can use, too. 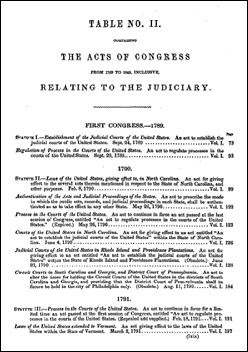 It begins, on that page, with the acts Relating to the Judiciary — everything from that very first act setting up the very first federal courts called the Judiciary Act of 178911 through to laws setting up federal courts in Iowa and Florida as they were admitted to the Union12 — and every statute is cited to the specific volume and page of the Statutes at Large where it appears. Sometimes there are goodies hiding in those tables at the beginning or the end of those books. I put together this list to give a summary of many of the records at government levels higher than the county courthouse. Each territorial government has a territorial legislature with private and public bills and laws that mention individuals, petitions, executive records for the governor, and territorial court cases. Each of the 50 states has a legislature with private and public bills and laws, petitions, executive records for the governor, and a state supreme court. Each of the original 15 English colonies had an assembly with various public and private laws, a governor’s council, records for a colonial governor, and colonial court cases. The old country has its own collection of colonial records created by Parliament, the Crown, the Prerogative Court of Canterbury, Board of Trade, and various other boards and English courts. Our federal government adds private and public bills and laws with Congress, the American State Papers, and Federal Courts. The executive branch has cabinet office and agency records. The “Letters Received By…” for each federal office can be a huge resource, but it is underused.